The stories in Feathered Serpent, Dark Heart of Sky trace the history of the world from its beginnings in the dreams of the dual god Ometeotl, to the arrival of the Spanish conquistadors in Mexico and the fall of the great city Tenochtitlan. In the course of that history we learn about the Creator Twins, Feathered Serpent, and Dark Heart of Sky, and how they built the world on a leviathan’s back; of the shape-shifting nahualli; and the aluxes—elfish beings known to help out the occasional wanderer. And finally, we read Aztec tales about the arrival of the blonde strangers from across the sea, the strangers who seek to upend the rule of Motecuhzoma and destroy the very stories we are reading. 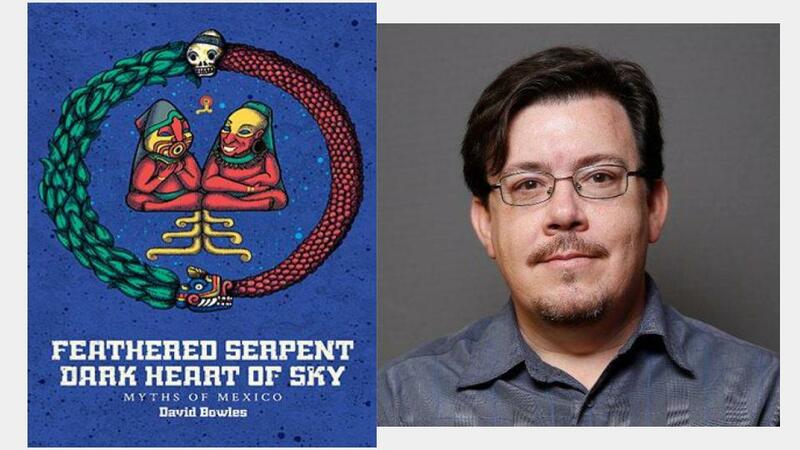 David Bowles stitches together the fragmented mythology of pre-Colombian Mexico into an exciting, unified narrative in the tradition of William Buck’s Ramayana, Robert Fagles’ Iliad, and Neil Gaiman’s Norse Myths. Readers of Norse and Greek mythologies will delight in this rich retelling of stories less explored.